Advanced features (this page) ◊ Help files - in English! Want to turn on the desktop language bar? 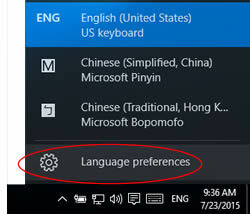 The first step in accessing advanced features of the Chinese IMEs is to turn on the desktop language bar. Microsoft documentation has in the past also called this the "language band" since it can be a section on your taskbar, and "taskbar language bar" sounds a bit awkward. But it can also float anywhere on your screen as a separate bar, so overall it's a bar. Or anyway that's my story, and I'm stickin' to it. 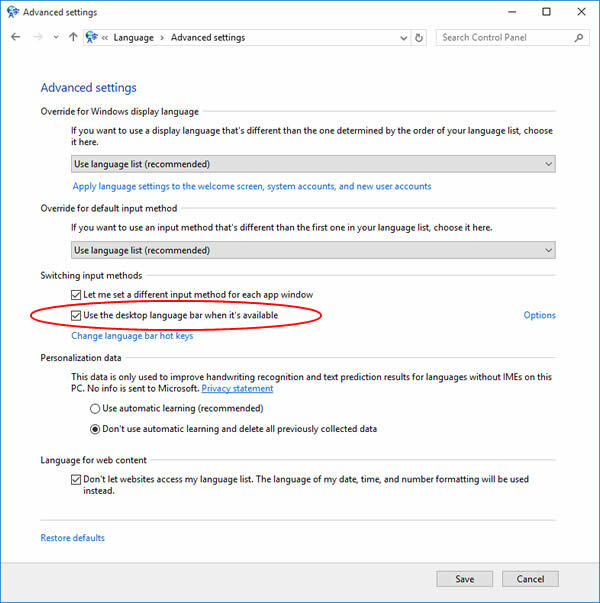 The Windows 10 one-year "Anniversary Update" (version 1607, released July 2016) introduced the option to turn on the desktop language bar for all IMEs including Microsoft Bopomofo from within the Microsoft Pinyin options panel. But I am going to take you to the classic Language control panel, where you can turn this on and also access other advanced features. If you use the Language Menu instead, it's a few more clicks in. Select "Language preferences". In the Time and Language Settings panel, under the Region & language, scroll down to "Related settings". Select "Additional date, time, and regional settings". This will open the classic "Clock, Language, and Region" control panel. Select "Language". In the "Advanced settings" control panel, under "Switching input methods", select the box for "Use the desktop language bar when it's available", and click the "Save" button. Notice in that same area, above is an option to tell the system to remember which input method you were last using in each application window. This can be a real time-saver. And below is a link to the language bar hot keys control panel, which I will discuss below. Elsewhere on this control panel are other preferences that may be important to you. The "Chinese, Traditional" MS Bopomofo IME Tool Menu has the most toys. The Quick, Cangjie, and Aray keyboards do not offer any of the additional options shown here. 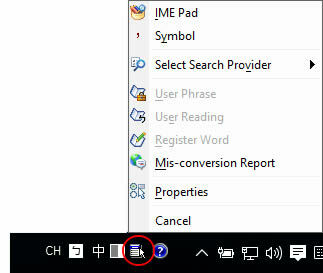 Click the Tool Menu, circled in the image here, to get to the IME Pad and other features there, and to open the Properties control panel. The IME Pad for Traditional Chinese can be selected from the top of the Tool Menu shown above. It offers lookup by stroke number, radical, or handwriting,* as well as punctuation and buttons for entering selected characters directly into your current document. *Note: the new Touch Keyboard offers handwriting for Traditional and Simplified. The Traditional Chinese IME Pad offers offers a handwriting feature. I shall refrain from demonstrating this feature with my left-handed foreign-devil controlled mouse. I am "Pinyin" Joe, after all. Many still prefer this to the new Touch Keyboard for handwriting. 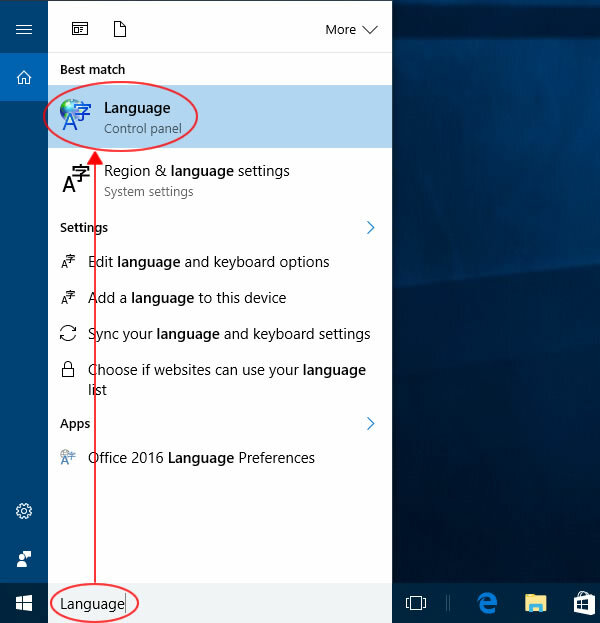 In Windows 10, pressing <Windows>+<Spacebar> will switch between languages and keyboards, But the desktop language bar has its own more extensive set of hotkeys (a.k.a. "hot keys"). To make changes, click the "Change Key Sequence" button. In that same Text Services and Input Languages control panel, you can click on the "Language Bar" tab to adjust when and how the desktop language bar appears, but most people leave those defaults as they are. 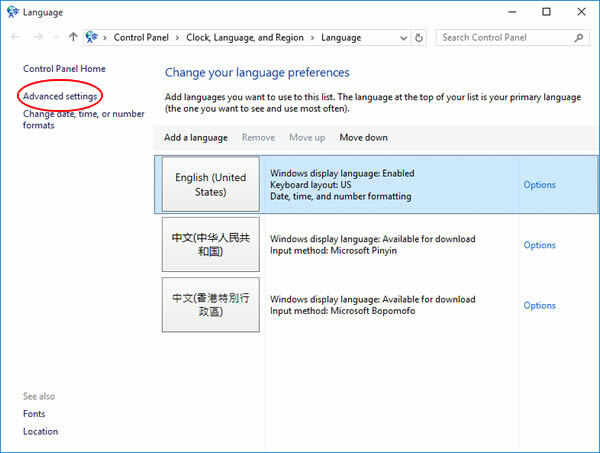 *See also the new Windows 10 Settings panel for Microsoft Pinyin. 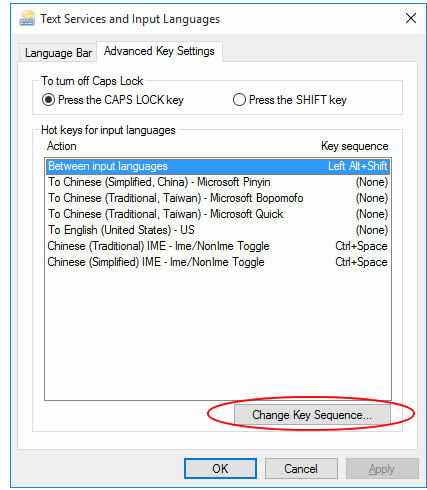 It allows you to control the Chinese/English hotkey with the options "Shift", "Ctrl", or "None". OK? I plan to write up several more "power user" features in separate FAQs, like traditional/double-byte punctuation, after I finish the main Windows 10 pages. For now, please see the other setup pages below.